7 Im gonna tell ov teh kindnesez ov teh lord, Teh deedz 4 which he iz 2 be praisd, Accordin 2 all teh lord has dun 4 usâ€” Yez, teh lotz da gud things he has dun 4 da houz ov israel, Accordin 2 his compashun an lotz da kindnesez. 8 He sed, "surely they r mah peeps, Sons hoo will not be false 2 me"; An so he became their savior. 9 In all their distres he 2 wuz distresd, An teh angel ov his presence savd them. In his luv an mercy he redeemd them; He liftd them up an carrid them All teh dais ov old. 10 Inn bwingen manee kittehs tah gloary, its watz fitin dat Ceiling Cat, who haz maids evahweefi, shuld purrfekt salfaeshun bie sufahwen. 11 Dee kittehs dat maek dem kittehs holey an dah kittehs dat arr maid holey arr inz dah saem famawee. Soo Jebus no iz ashaimd tah call dem bwoatas. 12 Him sayzes, "Ai willz say my naim tah mi kittehs; en dah pwescense of dah kittehs ai wilz sing yuz prayzes." 13 An agan, "Ai willz puts my twast en hims." An agan himz says, "Hee am ai, an dah kittehs Ceiling Cat haz given tah mee." 15 an fwee dah kittehs hoo arr en caiges bi der feerz of def. 16 Foe hims no hewps dah birdcats, buh Abraham's kittehs. 17 Caz of dis himz hads tah bee maid liek us kittehs en evahwee way, so dats hims may bee ah faiful kitteh tah Ceiling Cat, an dat himz mite atoan fur dee invisible errors of dah kittehs. 18 Caz him himzself sufahd wen himz wah temptaed, hims iz abah tah helpz dose hoo arr bein temptaed. Srsly! 13 And wen dey were gone teh hover d00dz of teh Ceiling Cat appeareded to Jozif and sayed "Hai, get up nao, and taek kitlin and mudder into Eejippt0rz, and stay dere till I sez, cos Herrot is lukin for teh kitlin and him gonna pwn him!" 15 and stayed dere til Herrot was "lol *dead*", so ting wud be liek teh profet sayed wen he sayed "Out of Eejippt0rz I done called mah son"
16 B4 he dyd, Herrot, wen he saw teh wies men was lollin at him, was rlly ticked, so him goed owt and pwned all teh kitlins dat woz in Beetleham, and teh beaches round dere, dat was under 2, cuz teh kitlin he waanted to pwn was dat age. 18 In Romma dere was a mew herd, crine vaerdy sadly, Raychul crine for her kitlins, and wud not be comfortd, cuz dey iz gon. 20 sayin "Hai, j00 can go hoem nao, Herrot am dead, lol"
21 And him went home to Izreal wit teh kitlin and him mudder. 23 and him moved into Nazref, so teh profets wud be rite wen dey sed "Ppl gonna call him a Nazreem"
This is a fun concept and I love the LOLcats. 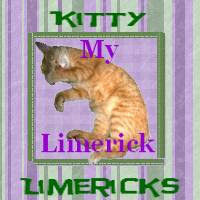 Thank you for the link to Kitty Limericks. I hope to start blogging there again soon.